Whistleblower website WikiLeaks has released classified video footage of a U.S. military incident, essentially peeling the scab off of a three-year-old wound. In 2007, a helicopter attack in a Baghdad suburb led to the deaths of at least a dozen people, including two Reuters news agency employees, photographer Namir Noor-Eldeen and driver Saeed Chmagh. After demands by Reuters, the incident was investigated, but the Pentagon had defended the killings, saying the actions of the soldiers were in accordance with its “Rules of Engagement,” and no disciplinary action was taken. WikiLeaks has posted both a full-length, 38-minute version of the video, titled “Collateral Murder,” along with a shorter, 17-minute version. That condensed video is drawing criticism and creating a little confusion as it does not include earlier scenes that show clashes in the neighborhood, and that one of the men in the group was carrying a rocket-propelled grenade (RPG). A list of names and addresses of people allegedly in the British National Party, which the BNP claims to be false. Screenshots of the U.S. vice presidential candidate Sarah Palin’s email inbox, pictures and address book. A copy of the Standard Operating Procedures for Camp Delta, which detailed restrictions placed on prisoners at Guantanamo Bay. Several hundred documents about the offshore activities of Swiss Bank Julius Baer. Information on toxic dumping in Africa. The documents are all housed on a few dozen servers across the world, including countries like Sweden and Iceland, that have permissive webhosting laws. Sweden is also a favorable choice due to laws that require journalists not to reveal sources. WikiLeaks is operated by an organization known as the Sunshine Press and is funded by donations, but has no particular location, so it remains outside of the reach of any institution or government that seeks to silence it. Its digital format also allows immediate publication, whereas court orders could potentially stop print publication in the past. Anyone can anonymously submit information to WikiLeaks, but a team of reviewers, consisting of volunteers from the mainstream press, journalists, and WikiLeaks staff, decides what is actually published. There is a core group of five full-time volunteers and up to 1,000 people the group claims it can call on for expertise for things like encryption. Transparency is the victor here. More information and even more yelling back and forth gives everyone more data and opportunity to make up their own minds. And it keeps life-and-death topics like war fully in the bull’s-eye heat of aggressive social interaction. That’s what’s really changed since my war correspondent days. No one today has to be a passive non-combatant in the important moments of our culture. According to WikiLeaks, 139 journalists have been killed in Iraq between 2003 and 2009. David Schlesinger, Reuters editor in chief, hopes to meet with the Pentagon to “press the need to learn lessons from this tragedy.” According to The New York Times, WikiLeaks claimed on Tuesday to have another encrypted video that shows an American airstrike in Afghanistan that killed 97 civilians last year. 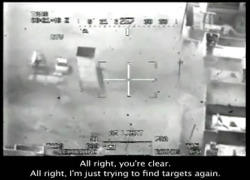 Screen capture from video used under Fair Use: Reporting.